Danny Garcia is still undefeated, and still the 140-pound champion of the world, as he bested Lucas Matthysse over 12 grueling rounds. Danny Garcia proved the skeptics wrong yet again, beating Lucas Matthysse over 12 rounds to retain his WBC and WBA junior welterweight titles. Garcia won on scores of 114-112, 114-112, and 115-111. Bad Left Hook had it 114-112 for Garcia, who stays undefeated, improving to 27-0 (16 KO). Garcia busted up Matthysse (34-3, 32 KO) over the fight, shutting his right eye in the middle rounds. When all was said and done, the 25-year-old Garcia simply proved to be the true champion of the 140-pound division. Matthysse continued to pour on the pressure, but he was a sitting duck for left hooks, which he just couldn't see coming. The fight was high drama with plenty of action, living up to the hype, even though it didn't go the way most expected. "I'm the champion of the world. The champion is not scared of nobody. If you can make it out of Philadelphia, you can make it out of anywhere," Garcia told Jim Gray when asked how he wasn't intimidated. "I felt when it got into the later rounds, I threw combinations. He just stood there and didn't get out of the way. Matthysse is a great warrior. He lived up to his name, he's a machine. He kept coming at me," Garcia said. "I only had one eye for half of the fight. No excuse. Garcia did a great job," Matthysse told Gray. "I'm very proud of what I did. Garcia's a great champion." It's time to stop saying Danny "knows how to win." He wins because he's a damn good fighter, and that's it. LAS VEGAS (AP) — Danny Garcia defended his WBC and WBA 140-pound titles with a unanimous decision over Argentina's Lucas Matthysse on Saturday night, remaining unbeaten with a gritty comeback victory. Carlos Molina claimed Ishe Smith's IBF 154-pound title belt with a dull split-decision victory, and welterweight contender Pablo Cesar Cano won a split decision over Ashley Theophane at the MGM Grand Garden on the undercard of Floyd Mayweather Jr.'s bout with Saul "Canelo" Alvarez. Garcia (27-0) spent several rounds feeling out Matthysse's impressive power before rallying in his fourth title defense, even knocking down Matthysse in the 11th round. "I'm the champion of the world," Garcia said. "The champion of the world isn't scared of nobody." The fight turned in Garcia's favor when Matthysse's right eye swelled shut in the seventh round, allowing the Philadelphia fighter to pepper his power-punching Argentine opponent with left hooks and combinations. Garcia got a flash knockdown of Matthysse in the 11th when the challenger got caught up in the ropes, although Matthysse immediately bounced back up. The champion even hung on after referee Tony Weeks docked a point with 37 seconds left in the final round for a low blow. "I knew if I slowed him down, I could go to the body," Garcia said. "I'm a great warrior. He kept coming, but I fought my heart out because I'm a Philadelphia fighter." Both fighters landed roughly 36 percent of their punches, but Garcia threw 78 more blows. The champion also connected with 48 percent of his power punches to Matthysse's 44 percent. Garcia has emerged as a durable champion during a run of impressive victories over the past two years, but Matthysse has become one of his sport's most intriguing fighters for his formidable punching power and heedless style. Matthysse (34-3) had won six straight fights, all by stoppage in increasingly dramatic fashion. His only previous career losses were debatable decisions to Devon Alexander and Zab Judah. With superior aggression and power, Matthysse appeared to win most of the early rounds — until the seventh, when his right eye abruptly swelled nearly shut. After several rounds of punishment from Garcia, Matthysse responded with fire in the 11th round, chasing Garcia around the ring and knocking out his mouthpiece. But Garcia caught Matthysse along the ropes late in the round, knocking the Argentine to the canvas with a combination punctuated by a right hand. Garcia lost a point in the final minute, but two judges scored the bout 114-112 for Garcia, and a third favored the champion 115-111. The Associated Press also scored it 114-112 for Matthysse, giving five of the last six rounds to the champ. The 35-year-old Smith (25-6) won his title in February with a narrow decision over Cornelius Bundrage in Detroit, but his reign as Las Vegas' first born-and-bred world champion extended only one bout. 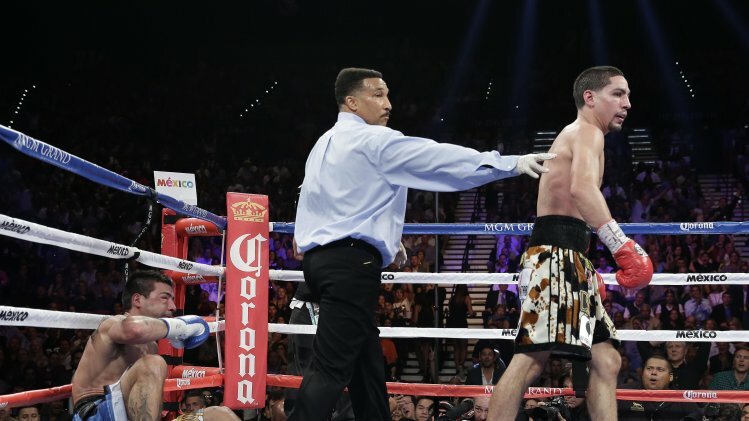 Smith struggled to connect with anything against Molina (22-5-2), the gritty Chicago-based fighter who fought Julio Cesar Chavez Jr. and Erislandy Lara to draws earlier in his career. While Molina didn't exactly overwhelm Smith in a fight featuring plenty of clinching and missed punches, Molina consistently was more aggressive and creative all the way to a strong 12th round. Two judges favored Molina 117-111 and 116-112, while a third favored Smith 116-112. "I'm happy about my win tonight, but I'm never happy or satisfied with my performance," Molina said. "I always feel like I could do better." Molina thinks his next bout should be a unification fight against Mayweather or Alvarez: "I want the winner of this fight tonight. It only makes sense." In the opening fight on the pay-per-view card, Cano (27-3-1) largely dominated Theophane, a 33-year-old welterweight from England also backed by Mayweather's promotional company. Although Cano staggered Theophane a few times, bloodying his opponent's nose and never really getting hurt himself, judge Ricardo Ocasio awarded the final five rounds and a 96-94 edge to Mayweather's fighter. The other two judges comfortably favored Cano, who has lost title fights to Erik Morales and Sugar Shane Mosley. 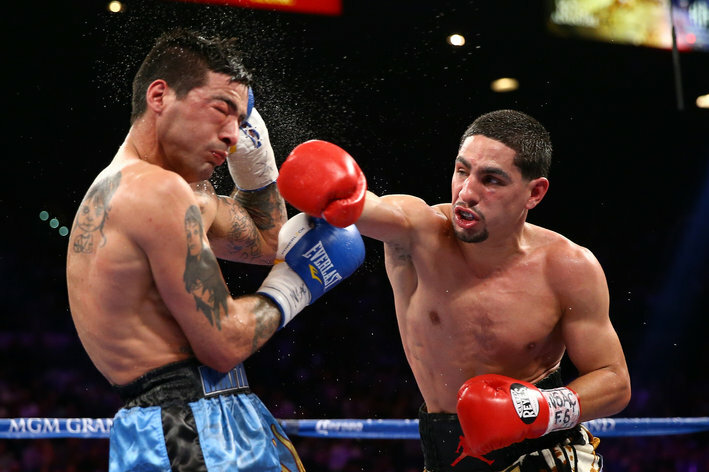 LAS VEGAS -- Danny Garcia retained his super welterweight titles against favored Lucas Matthysse by battering the Argentine's right eye shut, then battering him in the second half of the fight. Garcia's unanimous-decision victory allowed him to retain the World Boxing Council and the World Boxing Association "Super" titles against the most fearsome puncher in the 140-pound division. The fight was the semi-main event on Saturday's Floyd Mayweather-Saul "Canelo" Alvarez card at MGM Grand. Garcia (27-0) found himself in the expected rugged fight through six rounds. But at the end of that round, Matthysse (34-3), who has 32 knockouts, reached to touch his right eye with his right glove. When he came out for the seventh round, his eye was swelled shut. Garcia used the eye for target practice in the second half of the bout and the ringside physician was called in to examine Matthysse multiple times between rounds. Garcia spun Matthysse into the ropes and decked him with a short combination one minute into the 11th round for the fight's only knockdown. He gave back that extra-point advantage when he had a point deducted by referee Tony Weeks for a low blow in the 12th round, after several warnings. Judge Glenn Trowbridge scored it 115-111 for Garcia, while Robert Hoyle and Jurgen Langos agreed at 114-112. Garcia, 25, of Philadelphia, earned $1.5 million for his fourth defense of the WBC title and his third defense of the WBA Super title. Matthysse, 30, of Junin, Buenos Aires, Argentina, was fighting for a world title for the first time. He made $800,000. In the other title fight on the card, Carlos Molina, a Mexican who lives in Chicago, lifted the International Boxing Federation junior middleweight title from Ishe Smith on a split decision. Smith was the first native Las Vegan to win a world title, when he beat Cornelius "K-9" Bundrage in February in Detroit, but came home and lost it in his first defense. Two judges saw it 117-111 and 116-112 for Molina, while Adelaide Byrd disagreed at 116-112 for Smith. The world title fight which was supposed to be won by whichever knock-out artist landed his big bomb first ended in an epic 12th round slugfest. Danny Garcia, who knocked out Amir Khan, and Lucas Matthysse, who stopped Lamont Peterson who had beaten our former champion from Bolton, both proved they could take as well as deliver huge punches. After they were dragged apart at the final bell, Garcia kept his unified world light-welterweight titles by unanimous decision. Garcia, who has improved as a boxer since his shock KO of Khan, fought his way back into it and began landing his big left. Both men’s chins withstood some massive blows and displayed enormous courage, although when desperate Garcia resorted to very low blows. Matthysse was somewhat hard done by when referee Tony Weeks called a knock-down for Garcia although the last of the flurry of arms and fists looked like a push. He also allowed Garcia to continue punching when his opponent was on his knees. That 10-8 round gave Garcia a vital edge. It insured him against the one-point deduction for yet another low punch in the 12th, which will also be remembered for its epic, toe-to-toe climax with both men beckoning each other into battle. Two judges scored it 114-112 , the third 115-111, all for Garcia.